This FREE million dollar bill look just like real money. 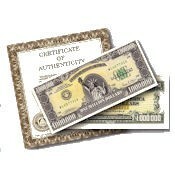 These are some of the most authentic million dollar bills ever printed and include unique seals, original looking emblems, numbers, realistic money colors and many more authentic looking "money" markings. Even the size is the exact size of real U.S. money! You should of course know that the U.S. government never actually printed a real million dollar bill so these bills are not real enough to spend (and you sure wouldn't want to try it), however they are 100% legal to own by anyone as fun novelty bills.